A Red Line train arrives at the Pershing Square Station. by the end of that decade, Metropolitan Transportation Authority officials said Monday. Starting next week, Metro staffers will hold a series of public meetings to discuss options for extending the Purple Line subway to Santa Monica -- one of four major transit projects that received the green light from the agency's board of directors in January. "Public input is going to be really critical," said Metro spokeswoman Jody Litvack. 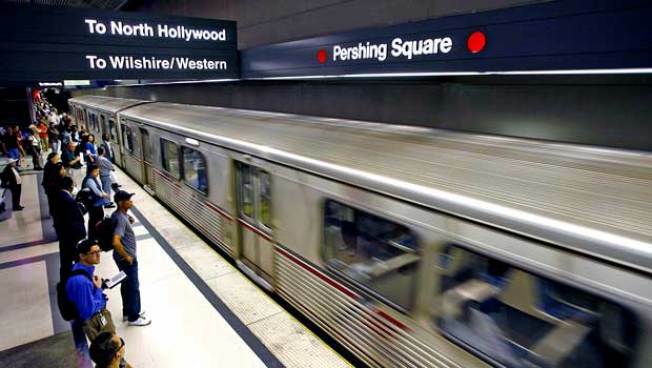 Attendees at the meetings will be presented with plans to extend the subway along Wilshire Boulevard, with a possible second leg that would connect to the Red Line Hollywood/Highland Station via Santa Monica Boulevard. Metro officials also will discuss the possibility of not extending the subway line at all. Currently, the Purple Line runs from downtown Los Angeles to Wilshire Boulevard and Western Avenue. Metro will use public input to help develop a locally preferred plan that will then be presented to the agency's board of directors for approval. Funding for the proposed extension would come in part from the half-cent sales tax increase under Measure R, which was approved by voters last November. Initial estimates put the cost of the Wilshire-only subway at $6.1 billion, with the cost rising to $9 billion if the second leg to the Red Line is added. About $4.1 million is allocated to the Subway to the Sea from the expected $40 billion that Measure R is expected to rake in. The remainder of the funding will be sought from the federal government and possibly private sources, said project director David Mieger. One of the keys to garnering federal money will be proving the cost-effectiveness of the project -- that is, comparing the cost to build and operate the rail line to its expected ridership and the level of congestion in the region it will run through. "We know that the Wilshire project appears to be a cost-effective project," Mieger said. The alternative that includes the second track through West Hollywood doesn't yet make the grade, however, and will need some adjusting to be competitive for federal funds, he said. The shot in the arm provided by Measure R funds should rapidly expand the entire transit network and boost ridership throughout the system, he said. Given the cost and scale of the Westside subway, it will likely be built in three-mile segments, Mieger said. "We can't build all of this at once," he said. "The initial Red Line that we built back in the '80s and early '90s was actually four segments that we built over a 17-year period." The first segment would likely extend west along Wilshire Boulevard to Fairfax; with the second reaching to Century City; the third to the San Diego (405) Freeway in West Los Angeles; and then on to Santa Monica, according to Metro officials. April 20, Westwood Presbyterian Church, 10822 Wilshire Blvd. April 23, Santa Monica Public Library, 601 Santa Monica Blvd.